The item Acting : cut the crap, cue the truth. Living the life and doing the job, Natalie Burt, (electronic resource) represents a specific, individual, material embodiment of a distinct intellectual or artistic creation found in Richland Library. 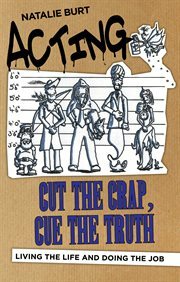 Acting: Cut the Crap, Cue the Truth fills a gap in the drama school curriculum, tackling many areas which are unaddressed during training and discussing issues that are more often than not hushed up afterwards. Starting from the vital final stages of training, and on to life as a professional, Natalie Burt - a young, jobbing actress - moves systematically through the challenges that every actor faces; from making strategic career decisions, to the logistics of TV and film sets and voice over work, to more personal matters such as renting and flat-sharing, finance and well-being when out of work. Rejecting gimmicks and quick fixes, she encourages motivational thinking and entrepreneurialism using an informal, unapologetic and humorous tone whilst sharing information that is current, relevant and from the frontline. Or, as Natalie puts it, "a thorough, constructive and ball-achingly honest chat about the industry, written by someone who still has all their own teeth."